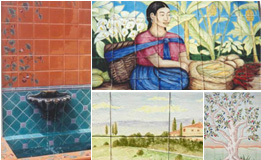 The Tile Studio has been the source for custom painted and fired ceramic tiles in Santa Barbara for over 20 years. Owner and artist Sheryl Wheeler brings her background in fine art and pottery together with a natural understanding of design and color. 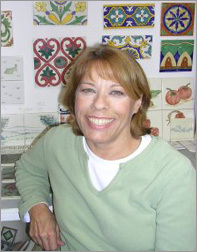 From a beautiful Tuscan scene for the kitchen to tasteful commercial signage, she can create custom murals and decorative tile borders for indoor and outdoor areas like pools and fountains on new construction or renovation projects. 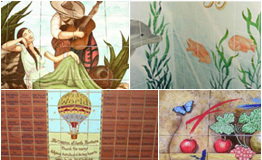 Our tiles are “painted” with ceramic glazes that are permanently fired into the surface of the tile, often with many layers of color and clear coat for a deep, rich quality. The Tile Studio offers design services and color testing as part of our commitment to your satisfaction as well as on site local visitation for exact measurement and proper installation guidance. We welcome your enthusiasm for personal expression and encourage you to browse our Tile Gallery of past projects for ideas and inspiration.